Tai Chi and Chi Kung Institute: What is Tai Chi? New Beginners Term 2 - 2019 . Courses are conducted during the state school terms. Discount Coupon "2 for 1"
Why is Tai Chi used for relaxation and stress management? Am I too old/young to learn Tai Chi? What equipment do I need to practice Tai Chi? Where does Tai Chi come from? Where should I begin when learning Tai Chi? What happens after I've learned the set? How does Tai Chi compare to Chi Kung? Available at classes or by mail. Tai Chi is a major branch of the traditional Chinese sport of Wu Shu. As a means of keeping fit, preventing and curing diseases it has been practiced since the 16th century. Its prime purpose is to promote health in a slow relaxed manner, without jarring and hurting one's body. The movements are slow, with great emphasis on posture and balance. The exercise requires a high degree of concentration, with the mind free of distractions. Breathing is natural, sometimes involving abdominal respiration, and its performance is in rhythmic harmony with body movements. Originally developed as a martial art, the movements of Tai Chi were quickly recognized as being beneficial to the body. The major emphasis of Tai Chi today is on its health benefits, although it may still be used as a system of self-defense after years of training and practice. Tai Chi makes an ideal complement to sport or other martial arts training as a warm up or warm down technique. What are the health benefits of practicing Tai Chi? Promote a general sense of well-being. The Tai Chi practitioner concentrates on breathing and fluidity of form. During the exercise all outside thoughts are swept away and only the task on hand is deemed important. It is for this reason that in the West, Tai Chi is now highly regarded for relieving stress and tension. Research by the Tai Chi & Chi Kung Institute however, has shown that those looking for stress management can gain more immediate relaxation benefits from Chi Kung classes, even at a very basic level. Generally, relaxation gained from performing Tai Chi begins after the set has been learned. 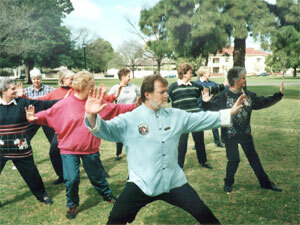 There is generally no age limit with Tai Chi - both young and old can practice the art. However, we provide specially tailored classes for children in primary schools and older persons. As classes are conducted for the purpose of slow and relaxing exercise, which involves deep concentration, it is not appropriate to have anyone in a public class who may cause distractions (such as young, noisy children). As no sports equipment, uniform or special grounds are required, Tai Chi can be done at any time and in any place. All you need is a small amount of open space, some loose, comfortable clothing and some flat-soled shoes that won't slip off during your practice. If possible, make sure that the sole of your shoe is flexible - some running shoes are too stiff for Tai Chi practice. The term "Tai Chi" is an accepted English equivalent of the Chinese word "Taijiquan" (Tàijíquán), where "Tai" means "grand" or "supreme", "ji" means "ultimate" and "quan" means "fist" or "boxing" (the Chinese characters for this word are shown to the right). It is accepted that the origin of Tai Chi was in the Chen Village in China. Today there are five main styles of Tai Chi: Chen, Yang, Wu, Sun and Woo (Hao). Each style is named for the family which traditionally created the style. Although each of the five styles has characteristics of its own, the essence of all are the same. The most popular style in China today is Yang style. Beginning students at the Tai Chi & Chi Kung Institute are taught the Yang Tai Chi in 24 Forms (or Beijing 24) set. This set has been used in China for the mass promotion of Tai Chi and is taught in China by government institutions such as the Beijing University of Physical Education. We believe that this set provides a good foundation for our students, which they can consolidate in their individual Tai Chi practice and build upon with intermediate and advanced sets. Tai Chi is generally not easy for the beginning student. While it is not physically hard or strenuous, remembering the movements and co-ordinating the mind with the body can be challenging. Like most arts (such at painting or music), to do it well takes a lot of physical practice and intellectual study to understand the movements and gain the maximum health benefit from the exercise. If you have little time to devote to your practice, but you are looking for relaxation and a pleasant, meditative feeling, we recommend Chi Kung - it is easier to learn and can provide relaxation benefits to the student immediately. Once the set is learned, the student can continue to practice their Tai Chi for refinement and relaxation. Tai Chi learned well is a wonderful way to exercise! The Institute offers Chi Kung (which you can learn at the same time as Tai Chi if you wish), or you can continue on to intermediate and advanced sets of Tai Chi, Weapon sets and Shaolin Arts. Chi Kung is a health exercise based on Traditional Chinese Medicine theory. It emphasises the flow of Chi through the acupuncture meridians and is excellent for calming the mind and regulating the breath. On the other hand, Tai Chi emphasises the natural movement of the joints and muscles and increases circulation and is excellent for improving the focus of the mind. For the beginning student, Tai Chi forms and movements are more complicated than Chi Kung forms and movements, therefore requiring more effort to learn them. You will need time to practice, patience with yourself and perseverance. The classes are structured quite differently. Chi Kung students are guided through the exercises by the Instructor, while Tai Chi classes place a greater emphasis on the student, who first watches the Instructor, practices the movement and then tries out the movement on their own.